Golf is for all ages, and all people. Golf simulators bring excitement and the potential to learn quickly how to hit golf balls, how to grip the golf club, and how to assess the quality of your golf shot. Our short lessons are inviting, fun, pressure free, and can lead to a lifetime of enjoyment with golf. 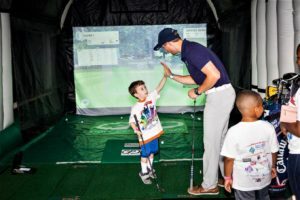 As a leader in the movable golf simulator business, we have a golf ecosystem that includes putting greens, chipping areas, hitting area nets, plus our patented inflatable golf simulator. We are innovators of the “Five Minute Golf Lesson” and acknowledge the fine writing that Hank Haney has done in writing articles that there are many ways to improve your game in as little as five minutes. It is Hank Haney who says that when he gives a golf lesson, he always studies a person’s practice swing. Although Hank Haney is not affiliated with Golf Pro Delivered, we want to acknowledge his wisdom, his teaching, and his inspiration to so many who want to become better golfers. 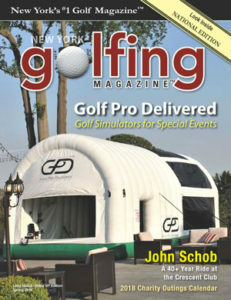 If you are having a corporate retreat, employee or customer recognition event, a business development event, a holiday party, retirement party, a charity golf outing for a nonprofit, we hope you will consider us at www.golfgpd.com. Thanks for a great 2018 and we are looking forward to 2019. You can contact us at [email protected] with any inquiry or if you want to comment on our company’s offerings.